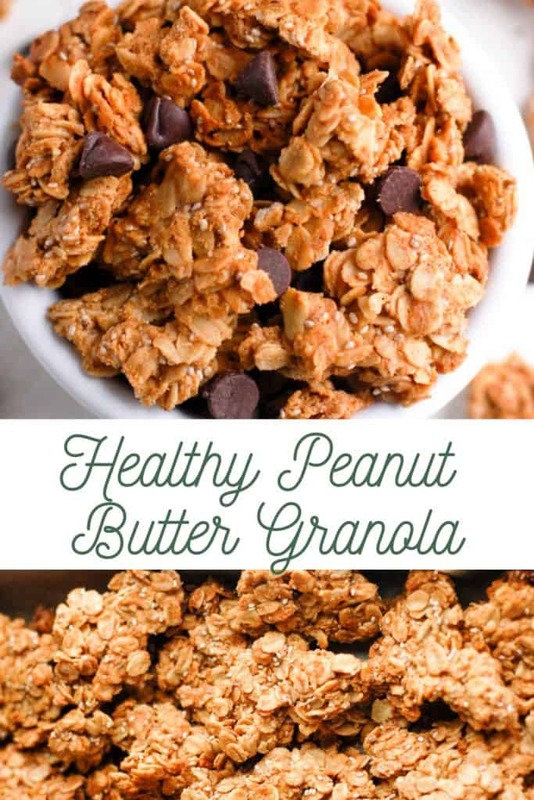 This Healthy Peanut Butter Granola recipe makes the easiest homemade granola filled with chunky clusters and simple ingredients! Made completely gluten free, dairy-free, and in 30 minutes or less! 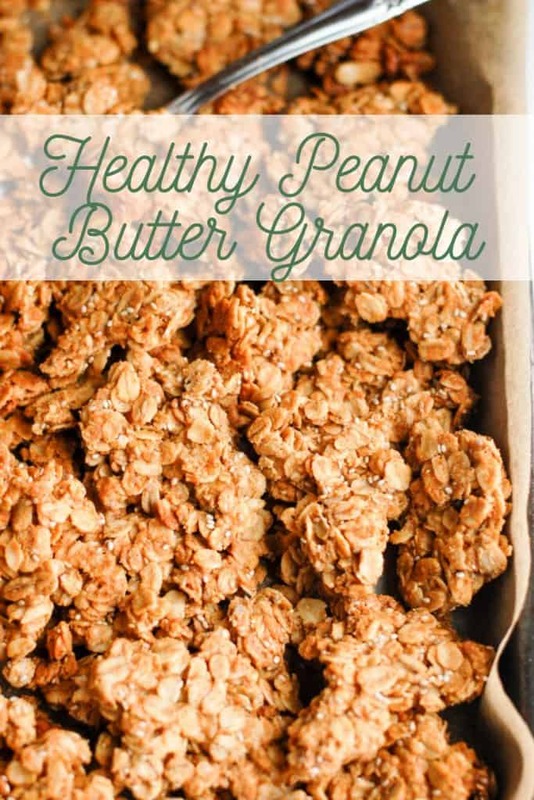 The only homemade granola recipe you will ever need is this healthy peanut butter granola. Trust me on that one. For as long as I can remember, I have been making my own granola. 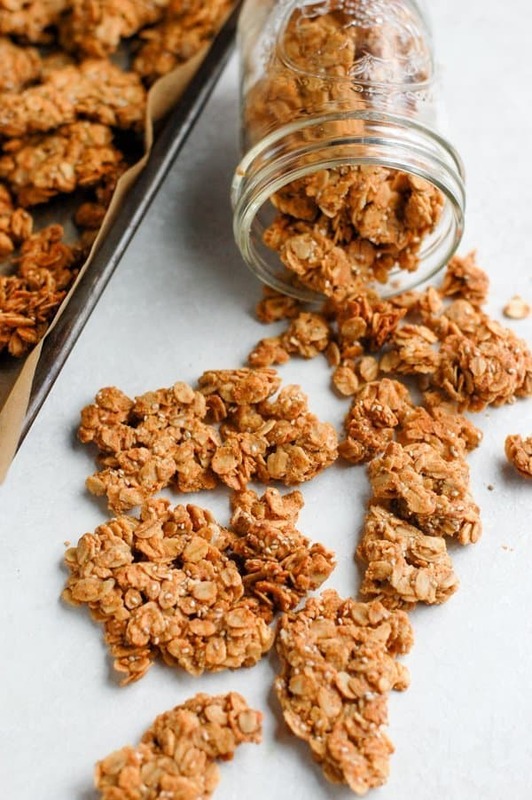 Granola has always been one of my favorite snacks and while I do still buy granola, I almost always have a batch of the homemade stuff on hand. I like it this way because I am able to control exactly what I want to put in it, right down to the amount of sweetness or the length of time I want to leave it in the oven for crunch factor. Granola was even the first post I ever shared on my Instagram, but let’s not look back at the first picture I ever shared because woah, that is an interesting first “foodie” picture. The recipe I’m sharing below has been in my life for the past ten years and has seen so many different varieties. I am completely able to make it from memory now – I mean I would hope so after ten years – but I am even at the point where I can just dump the ingredients in and hope for the best. But lucky for you all, I wrote the recipe down last time I made it. 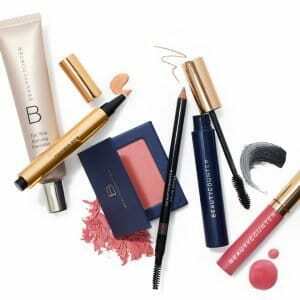 It is a very forgiving recipe and many of the ingredients can be easily swapped out for other products that you have in your house. My favorite part is adding in all different ingredients after it has cooled. That is when the true creativity comes out. I’ve eaten as is, and I’ve added everything from chocolate and dried cranberries, to peanut butter chips, to marshmallows, chocolate chips, and graham crackers. Treat this recipe like a blank canvas! 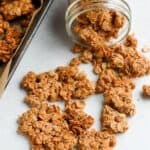 What is in this peanut butter granola? 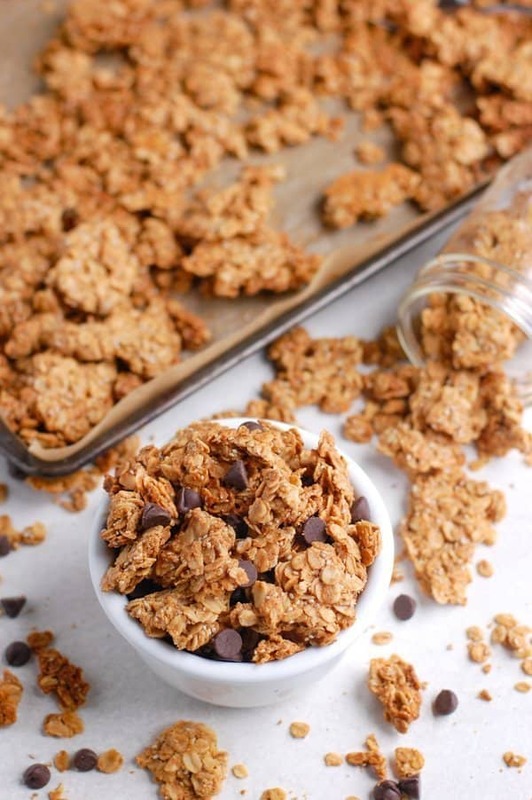 There are only a few very simple ingredients in this granola, let’s take a look! Rolled oats – I highly recommend using rolled oats for this recipe, they will work better than steel cut or quick oats. Natural peanut butter – I love the Whole Foods brand or the Trader Joe’s brand natural peanut butter with only two ingredients: peanuts and salt! It’s perfectly drippy and makes this granola perfect. Honey – one of my favorite natural sweeteners to use! Helps to gather the ingredients and create the beautiful chunky clusters. Coconut oil – keeps things moist and will crisp up the granola in the oven. Can use any oil you would like but I love the neutral coconut flavor in here. How do you make peanut butter granola? Good news! It’s literally so very easy to make! All you need to do is mix all of the ingredients together in one bowl, lay it flat on a baking sheet, and bake! 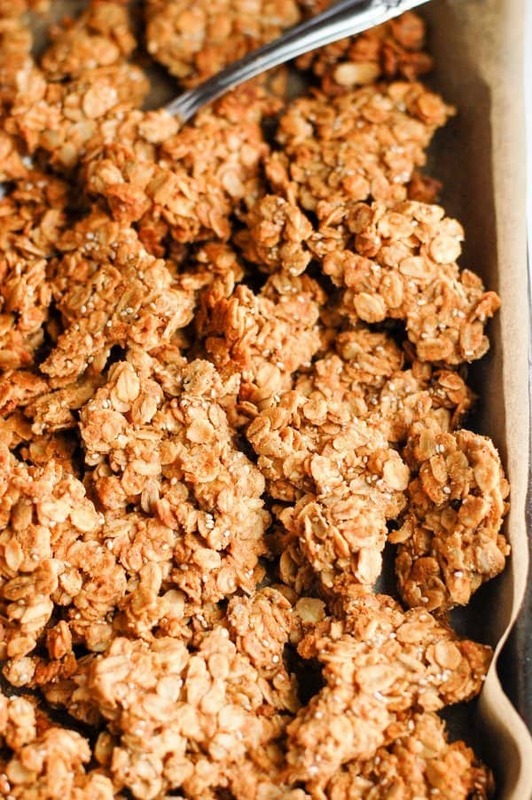 Once completely cooled, you will be able to break the granola up into desirable size clusters. How should I store this granola? Store it in a ziploc bag or an airtight container on the counter. It will last for about 2 weeks! 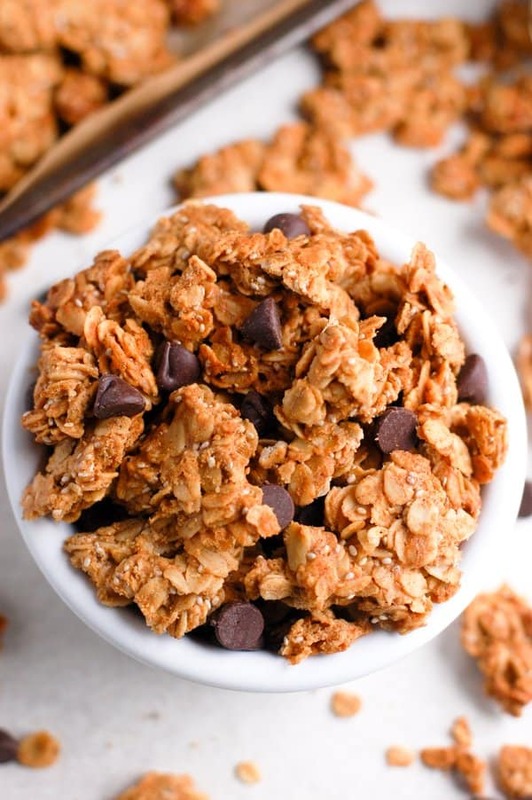 This Healthy Peanut Butter Granola recipe makes the easiest homemade granola filled with chunky clusters and simple ingredients! Made completely gluten free, vegan, dairy-free, and in 30 minutes or less! In a large bowl, mix together oats, salt, chia seeds, and cinnamon. Stir in peanut butter, honey, coconut oil, and vanilla. Let COMPLETELY cool before breaking apart. Store in airtight container on the counter. If I use peanut butter that has sea salt should I opt out of adding more salt? Also should I add more honey? I’ve been making granola forever on a regular basis and this stuff is literally amazing. The clusters and the flavors are so delicious and I can’t wait to make more….because I ate all of mine already. Thanks Erin! This is delicious. Just wondering what the serving size is ?